We often consider artistic works from a creative or cultural perspective, but I find it just as enlightening to examine them from an economic or evolutionary lens. How does the economic environment within which a developer finds themselves shape the form that art takes? As a case study of this in practice, I’ve been fascinated by a class of content-focused game that’s recently found a stable niche in the maturing mobile, PC and console markets. In mobile, we see examples like Sword & Sworcery, Device 6 or Monument Valley. In PC, you've got Kentucky Route Zero, Proteus and Gone Home. On console the trend is less pronounced, though Journey and Flower share some aspects. Strong focus on evocative content: Most of the game is composed of arcs that deliver heavily authored payloads. The player’s cognitive load is consumed by interpretation of stimuli not the planning or execution of actions. Light use of systems: Mechanically, the games tend to have limited interactive loops. There is little room for play within a mechanical space. The systems used are often highly traditional with a long history within other genres. Short playtime: Often 1-3 hours. This form thrives not due to some sudden explosion of artistic appreciation within the human race, nor due to universally-applicable intrinsic attributes of Truth and Beauty. No, instead these games thrive because they competently execute a development strategy that matches well with the current socioeconomic environment. Form is an accepted and standardized structure for a work of art. A painting stretched on canvas painted in oils that fits roughly on a living room wall is a common form of painting. A haiku is a form of writing. Unlike many media, the forms that a game might take are still quite fluid. Where authors of literature might feel locked into to well-established structures such as poem, short story, essay or novel, game forms are both broader and have less sharp boundaries. They vary radically in mechanics, scope, topic, number of participants, and hardware. The difference between a game of Tetris and a game of Charades can seem far vaster than that of a Shakespearean play and an encyclopedia entry. And as a designer, you often get to chose the unique form of your game. However, different forms of game have different levels of risk and trade offs. 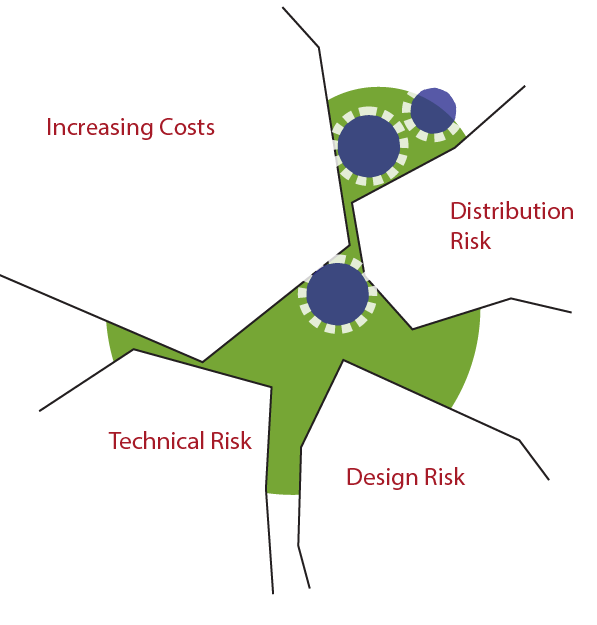 There’s internal risk such as design risk, technical risk, production risk. And then there's external risk such as distribution risk, market fit and many others. If any one of these aspect of the project fails, the development investment is lost. Any game design can be judged by the costs associated with building the game, the benefits of success and the downsides to failure. These are not abstract decisions. Most developers (even large ones) operate a paycheck or two away from bankruptcy. Paying the rent and putting food on the table are very real concerns. 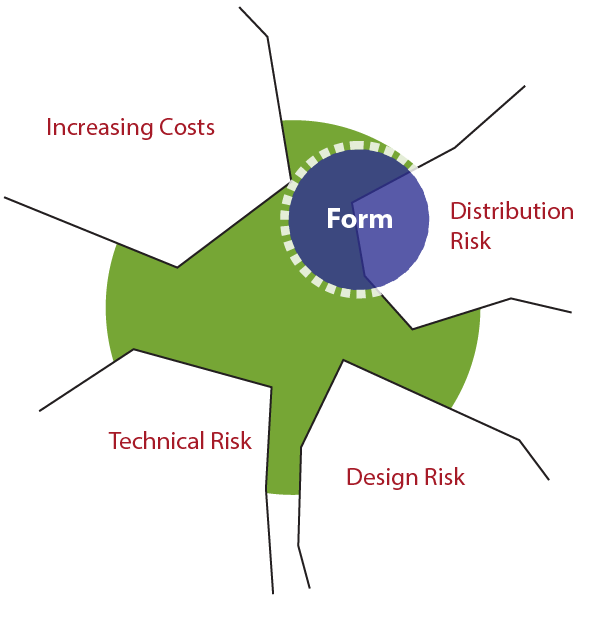 Many smart teams therefore choose projects of a form that minimize overall risk in order to dramatically increase their chances of future survival. Thus game developers have a great incentive to evolve game forms to fit whatever environmental pressures are present. If something changes in the environment that increases a type of risk, then you’ll see developers selecting, from this vast palette of potential forms, the options that mitigate that risk. Picture a thousand little Brownian developers blindly adapting their game forms to half felt market forces and thus converging on useful strategies. The process of evolving games forms can feel invisible. The vast majority of projects that don’t balance their risks correctly, fail and sink out of the cultural consciousness. Most creators are barely conscious of their influences and constraints. All we really know are the the survivors. When you see a new species of game thriving in the marketplace, you can start to ask some interesting questions. What are the culling mechanisms that let those games survive? What strategy was used that gave them an advantage over other possible designs? The things that make it through the filter give you some insight into the shape of the filter. What are some meaningful forces acting upon the modern indie developer attempt to sell a game for a fixed upfront price? Digital distribution and cheap tools: At the heart of the emergence is ability for small teams to build and release games at low cost. However, those markets are now maturing. A large audience trained on content consumption: The past decade of AAA titles perfected a variety of secondary content delivery standards via cutscenes, level design, voiceovers, etc. Gamers know and understand these methods. Over the decades, we've built up the equivalent of a trained audience that knows how to read. Average revenue for a product is dropping. In fact they are close to zero in mobile markets. The exponential distribution of revenue looks more L-shaped, with small number of titles making the majority of the money and no middle market to speak of. You have hits or failures with little in-between. Price per unit for games with an upfront cost is less than $0.99. As Steam opens up further, bundles proliferate and consoles introduce more free games, expect further price erosion for premium titles. You need to reach more people to make less money. Discoverability is weak. Discovery mechanisms are weak and heavily gated. Channels are also flooded with games of difficult to determine quality. A game benefits from being able signal quality 1 to 30 seconds of exposure since that is likely all the time it will get. Cost of production is increasing: Cheap tools bring the capital cost down, but labor costs remain stable. The need to hit ever increasing levels of quality results in an escalating cost curve. Five years ago, a hit premium game on mobile might cost $50,000 to build (including sweat equity). Now, for less revenue, you’ll see costs range from $200k - 1M (or higher). This expense is almost entirely due to content and feature competition: more art, more animation, increased use of 3D, more ‘required’ features. So it is hard to stand out, hard to make money and very easy to spend more than you make. Given such a landscape, what is a species of game that might survive? We are looking for solutions to the problems listed, but also ways of tackling multiple problems with the same resources. Efficient solutions survive. Fig 2. 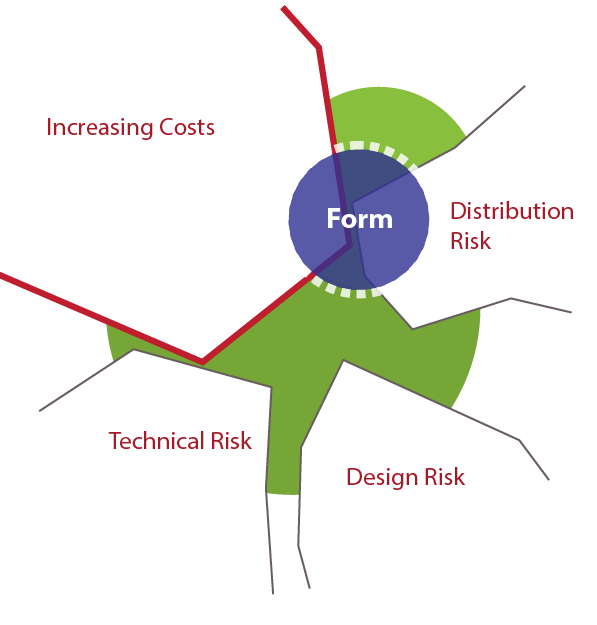 A strategy that mitigates technical and design risk. While taking on some distribution risk. Note that the following is by no means the only strategy. If you look around at other thriving developers, there are many alternatives. Nor is it a preferred one. This strategy has no inherent value beyond its functional benefits. Nor for that matter is it likely that the half-blind creators explicitly planned out their strategy. Like the flying fish and the (sadly extinct) flying shark, common strategies converge unwittingly from disparate perspectives as if shaped by an invisible hand. Environments have local maxima whether or not we are smart enough to perceive them ahead of time. Target a smaller scope: Content is expensive, but what if you make a game that is 1 to 3 hours, not 20 or 30? This simple change means you can cost 1/10th what a bigger title might. This is the defining economic attribute of this game form. Remove systems and features: Trim as many standard elements as possible and focus the game focus on one or two key features. Dear Esther, you walk around. In Gone Home, you walk around and click on objects. NPCs? Cut. Combat? Cut. Branching narratives? Cut. Keep your team small. Since labor is your largest cost, a small team means lower investment. Team members should being able to execute multiple aspects of development so you don’t need part time specialists. Keep your development cycle short(er): Spend 9-12 months on a title, not 18-24 months. Excel at what you attempt: It helps to have at least one or more people who are world class. Then build your game around their signature style. This makes up for some of the inevitable weaknesses that arise from small teams sizes, wearing too many hats and short schedules. Make high impact video and images. Since you have limited contact with potential players, you want the briefest glimpse of a game to excite them. Gorgeous visuals, evocative narrative hooks that can be grasped in a couple seconds work well. All many buyers need to see of Monument Valley is a single screenshot. Form relationships to amplify your signal for free: With a small team and a low marketing budget, free distribution is ideal. By forming relationships with journalists, streamers, taste makers and platform curators, you may get a mention or a feature. Of course, what you provide in return is a sellable story or validation of their long simmering world view. ‘Games as art’ is currently easy topic to bond over and all games with this form make the most of it. Rely heavily on static content: Art and video rarely fails on a functional level. There’s a risk in discovering an artist initially, but once on board, a competent artist tends to continue to produce competent art. Especially over short production schedules. You already need to make high impact visuals in order to get distribution, so there’s synergy here. Use existing mechanics: New mechanics take time to discover and often don’t work out. Invention is hard. By using well proven traditional mechanics, it is unlikely that the systems will delay your game. Turning a page or clicking a hyper-link is quite reliable. Reduce systemic emergence: Unplanned surprises hurt the schedule and cost you money. Avoid complex technologies: Technology that require strong expertise such as multiplayer servers or advanced 3D rendering is likely to blow up. So don’t do that. Make the game easy to finish: You want people to play the game, finish it and then talk to their friends while still in midst of the afterglow. This is a fast virus, not a slow one. Challenge is a useful tactic in other contexts (Dark Souls, Spelunky), but it is a poor fit when you want to deliver your beautiful load of content as smoothly as possible. Keep content highly interpretable: To offset the risk of the game being too short, you can implement content that either vague or open to many interpretations. This means that quality of your content can be lower without anyone being able to concretely describe it as such. A certain air of mysterious brilliance can act as a prophylactic against common criticisms; seed the doubt that a player may simply be unschooled in Imperial fashion. Engage the community: Ideally, you kick off a secondary wave of community engagement as players and critics invent their own detailed explanations for what may in fact be random (yet highly evocative) noise. Notice how all these pieces fit together into a coherent strategy. A small team with a strong artist and / or writer makes a short, attractive game that sells a light narrative. This also happens to be small enough a scope that they can finish and release it. Such a game is pretty enough to be featured and can be easily talked about. There’s also little risk for the player...they get this nice watchable nugget of content that’s super cheap and feels like a reasonable value relative to other comparable consumables like books or movies. This strategy formula isn't new in the grand scheme. Cheap, consumable content differentiated on gatekeeper-approved quality variables is at the heart of most media markets. In grand spectrum of possible games, the crop of boutique content games is one of the most conservative possible development strategies. Rosy cheeked media critics who might imagine the real history of games started in 2007 are likely excited by such titles. However, when compared to the rich systemic and narrative experimentation of the last 30 years, these forms are ultimately a retreat; survivalist risk mitigation marketed as hip cultural advancement. Such games tacitly give up on the idea that games could be a different type of thing than traditional media and adopt whole hog similar methods and limitations. At the crudest level, you flip pages, you see content. One should tread lightly in labeling this as a ‘bad’ change. Evolution does not judge. This strategy works. Good, passionate people are making money and surviving to build another game. That’s all you can really hope for as a game developer in a staunchly capitalist world. Since we are dealing with a conservative product strategy, comparable markets suggest where these might evolve over the next 5 years. Fig 3. Increasing costs put new pressure on the content heavy form. 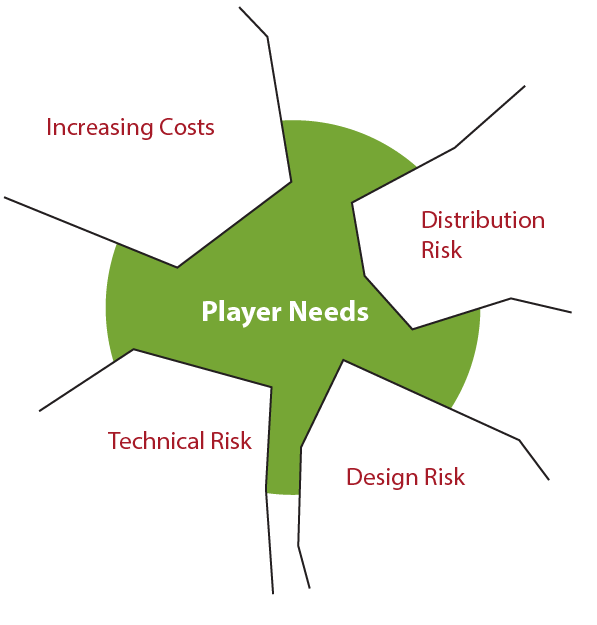 Player desire for the new form increases the overall market opportunity. Rapid market saturation: Since costs of entry in terms of skills and technology are quite low and first movers have almost zero competitive moats, new entrants should flood the market. This reduces the average success rate; most will not be profitable. Costs increase: As more entries appear, quality becomes more important. Those with cash spend more to keep or capture profitable audiences. Form-specific blockbusters emerge that spend the maximum amount to get the maximum audience. (I've called these genre kings in the past). Shorter length: Increased costs put pressure on decreasing the length even further. At some point players may decide that even an amazing 20 minutes is not worth 99 cents. Use of portfolios: Anthologies, bundles or subscriptions to content streams (aka magazines) are common methods of paying a population of authors in a hit driven ecosystem. If this shift in market structure occurs, middlemen begin dictating tastes even more strongly. Attempted differentiation based off thematic genre: Essentially the market fragments. As customers become trained in this new form, they’ll start to prefer specific types of content, much like we we see romance or mystery novels. First movers in thematic areas could tap a new sub-niche. Fragile specialist firms: Developers will need to specialize in this specific form to produce the best of breed content. However, this makes them inflexible when the need arises to adapt to new forms. We've seen this situation play out in the past with adventure games. It may seem silly to predict a future of saturation and collapse when there are so few of these games around. Yet markets are never eternal. Due to the lack of competitive moats, this one will mature rapidly and any golden period is likely to be short. In some sense, these short content focused games have made a deal with the devil. They've reduced their inventive mechanical scope and deliver all their value through highly polished content. However, one constant of the game industry is that content costs are always rising on a given platform. The cost curve is the monster that eats our industry. It is great to trim 1/10th of the content in a game to get your costs down, but what happens when the cost of making content then jumps by 10X? That brief advantage disappears. Though I don't personally make short content-driven games, I find this lens immensely useful in understanding how and why my work impacts the world. All art is shaped by the economics of a specific time and place. All standardized forms of art are but niches within a socioeconomic ecosystem. They are not eternal, they shift over time. Knowing that common forms are not some absolute truth empowers the clever and observant developer. It pays to ask: Who is making money? How do the developers, journalists, museums, critics or other middlemen benefit from promoting the works that they promote? Any creative work that depends on money-making institutions (big or small) is a commercial artifact, shaped by commercial constraints. None of us are truly independent creative entities. That’s at best a pleasant illusion, a lie. We all create within systems that cull our impassioned work with pragmatic brutality. We also, like it or not, preempt this culling through self-censorship. The flip side of this analysis is to look at the failures. Ask who is doing something different and failing? What structural and environmental factors explain why they are not making enough to eat? Once you've identified the problem areas, is it possible to spot gaps and come up with a new strategy that lets you thrive? When you see a new form of game emerging, ask why. Seek to understand the confluence of forces. Then use this rich understanding to invent your own unique form of game. Do your part to ensure that the evolution of games never stagnates.